Socks are traditionally knit in a circle with five spokes (still referred to as socks), but for many this method seems complicated. Of course, knitting on two needles is much easier especially that there are special knitting needles for circular knitting. Circular needles represent the upper ends of an ordinary straight spokes, but they are connected by a thin line. Vymazat loops at the ends of the spokes, as in normal knitting and then lowered them on the line. 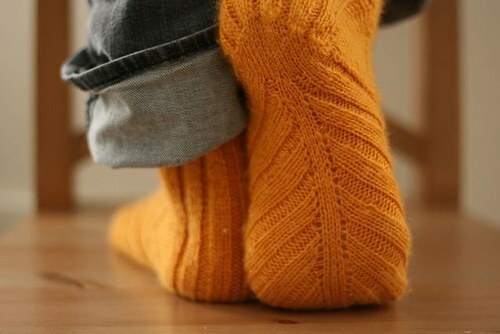 For knitting socks, pick up the knitting needles with the shorter line, because, if it is long, the knit fabric will stretch, and knitting will be very difficult. Dial on circular needles required number of loops in the same way as you dial a loop on the straight. Loops do not tighten and do not stretch. In the beginning of the series hang on the needle a special marker to know where the beginning of a circular row (instead of marker you can also use scrap yarn in a contrasting color that tie on the first loop of the row). Tie a rubber band 2x2 or 1x1, gradually descending loop on the line. When you get to the end of the row, throw the marker from left needle to the right and continue to knit in a circle to the required length gum (move marker in each row). The heel knit on two needles at the half loops in the same way as when knitting socks on the needles, in direct and reverse order at required length. Usually the number of rows for knitting the heel is half of the total number of loops. To form the heel, split the loop into 3 parts and knit, promazyvaya the last loop of the middle part of the first and third parts together (knitting in direct and reverse order) until the needle will not loop only the middle part. If the number of loops is divisible by 3 with remainder, add these loops to the middle part. Dial on the edges of the heel loop and knit the front stitch in a circle to the little finger. Now it is possible to diminish the loop to form the toe. Divide the loop into two parts (top and bottom). Provarite facial one loop, one loop clear, proverite following the front, and pull through her shot. At the end of the half loops provarite 2 together and one face. Repeat with the second half of the loop. Knit in this way until the spokes will not remain 6 loops. These loops pull out, tear off the thread and hide it inside the sock. On circular needles you can knit two socks at the same time from two different glomeruli.